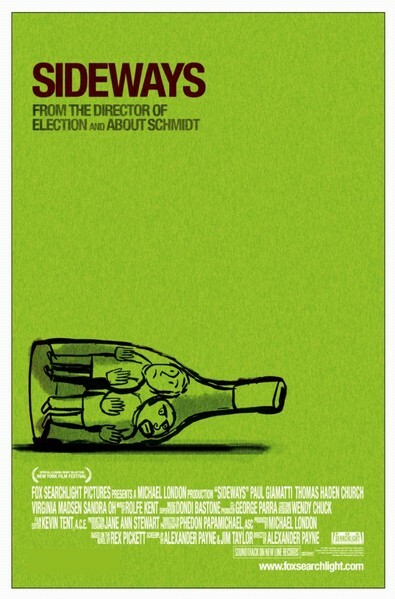 Story: Writer-director Alexander Payne's fourth feature film (following "Citizen Ruth", "Election" and "About Schmidt") starts with two old friends setting off on a wine-tasting road trip . . . only to veer dizzily into a wry exploration of the vicissitudes of love and friendship, the damnable persistence of loneliness and dreams and the enduring war between Pinot and Cabernet. The misadventures begin when Miles (Paul Giamatti), an un-recovered divorcee and would-be novelist with a wine fixation, decides to gift old college buddy and washed-up actor Jack (Thomas Haden Church) with a celebratory trip to the vineyards of the Santa Ynez Valley the week before Jack's wedding. The two couldn't be an odder couple. Jack is an over-sexed charmer; Miles is a sad-sack worrier. Jack is looking for his 'last taste of freedom'; Miles just wants to taste perfection in a bottle. Jack is fine with cheap Merlot; Miles pines for the elusive, perfect Pinot. Indeed, the only thing they seem to share in common is the same heady mix of failed ambitions and fading youth. And yet, as they make their way up the coast, Miles and Jack soon find themselves drowning in wine and women. Jack falls head-over-heels for a local wine pourer (Sandra Oh) and threatens to call off his nuptials. Miles begins his own romantic encounter with a wine-savvy waitress (Virginia Madsen). Both men careen dangerously and comically toward mid-life crises. Now, the wedding approaches and with it the certainty that Miles and Jack won't make it back to Los Angeles unscathed or unchanged . . . if they get back there at all.